73/250 is part of the 2016 Super Treasure Hunt set and 9/10 in the HW Exotics series. The Spectraflame blue car has the Ford logo on the hood and “TH” right behind the rear window. It has tinted windows, a gray interior, gray Real Rider 10-spoke wheels, and a gray plastic Malaysia base. Loose versions of the vehicle have appeared with different styles of wheels. 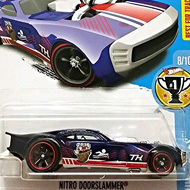 This vehicle can be found in mix “N” of 2016 Hot Wheels mainline cases. 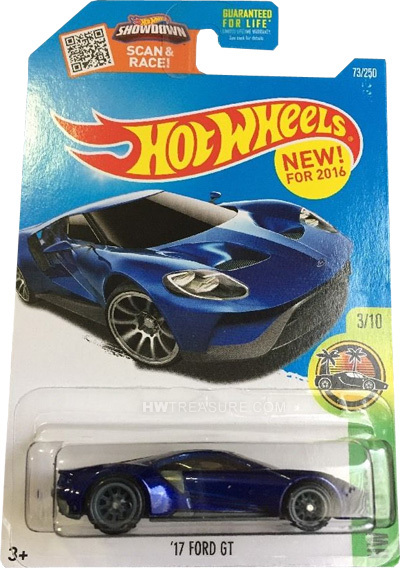 This Treasure Hunt and its mainline counterpart are the first appearances of the 2017 Ford GT. It is based upon the actual sports car that features an aerodynamic teardrop shape, carbon-fiber body, and a 600-plus horsepower V6 engine.